After witnessing a murder, nightclub singer Deloris Van Cartier (Whoopi Goldberg), is put into a government protection programme in the guise of a somewhat worldly nun. She brings her showbiz pizazz to a wobbly choir and in doing so turns around the fortunes of a failing convent. The opening of the film is set in Reno, Nevada, self-proclaimed ‘Biggest Little City in the World’ (though nobody seems quite sure what that means). The religious school of the prologue, in which the sassy young Deloris infuriates her teachers by naming the disciples as “John, Paul, George and Ringo”, is St Thomas Aquinas Church, 310 West Second Street, Reno. She grows up to perform old Motown classics in front of unimpressed gamblers in the ‘Moonlight Lounge’ of what appears to be the Nevada Club, North Virginia Street, Reno, which provided the casino’s exterior. It closed for good at the end of 1997 and was demolished in 1999. The interior, however, is Fitzgerald’s Casino, 255 North Virginia Street, across the road next to that famous ‘Biggest Little City…’ illuminated sign. This has since become the Whitney Peak Hotel. The seemingly naïve Deloris is shocked to find that her married boyfriend Vince (Harvey Keitel) is not only the Grade-A sleazebag she suspected but also a ruthless crime boss who thinks nothing of taking out a contract on her life. Reno is not blessed with such a striking art deco police station. The precinct out of which Detective Eddie Souther (Bill Nunn) works was really the much more photogenic Reno Post Office, now retail and office space 50 South Virginia Street at Mill Street. Souther spirits Deloris away to San Francisco to become Sister Mary Clarence at ‘St Katherine’s’, situated in a seriously rough neighbourhood of the city. 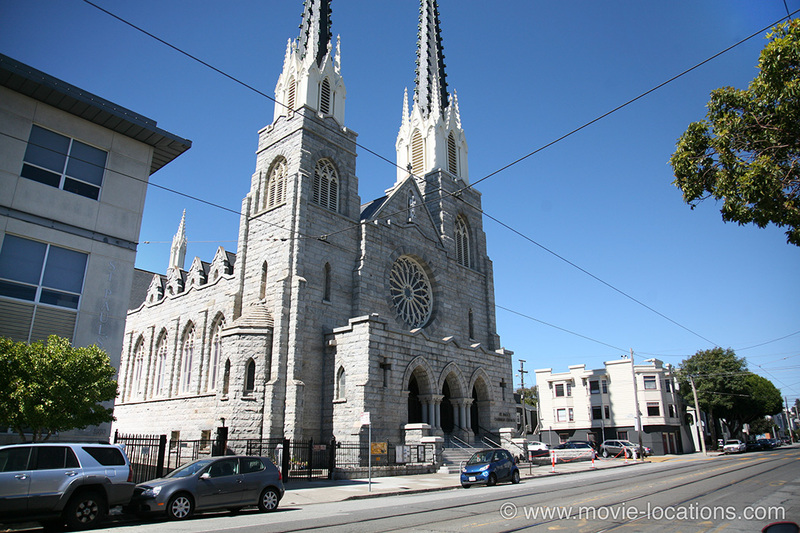 This ‘convent’ is actually St Paul’s Catholic Church, 221 Valley Street at Church Street, in San Francisco’s pleasantly Victorian Noe Valley, just below the eastern slopes of Twin Peaks, and nothing like as sleazy as it’s made to look in the film. Many of ‘St Katherine’s’ interiors were filmed inside the First United Methodist Church, 6817 Franklin Avenue, Hollywood, in Los Angeles, though the main body of the church in which the choir ends up performing for an appreciative Pope is the real St Paul’s. The exterior of First United can be glimpsed in The Godfather during consigliare Tom Hagen’s trip to see the Hollywood producer, and its gymnasium was famously used for the climactic prom of Back To The Future. Also in Los Angeles is the lowlife bar which appears to be just across the street from the convent and which gives rise to the film’s best line “If this turns into a nun’s bar, I’m outta here”. At the time of filming, as you can see, it was Basgo’s, 3909 West Sunset Boulevard in Silverlake, host of the notorious and wildly pervy Club F*ck!. This was formerly the Black Cat Bar, the site of what was up to then the largest gay rights protest, two years before the famous Stonewall riots in New York. The fact can’t have been lost on gay director Emile Ardolino. 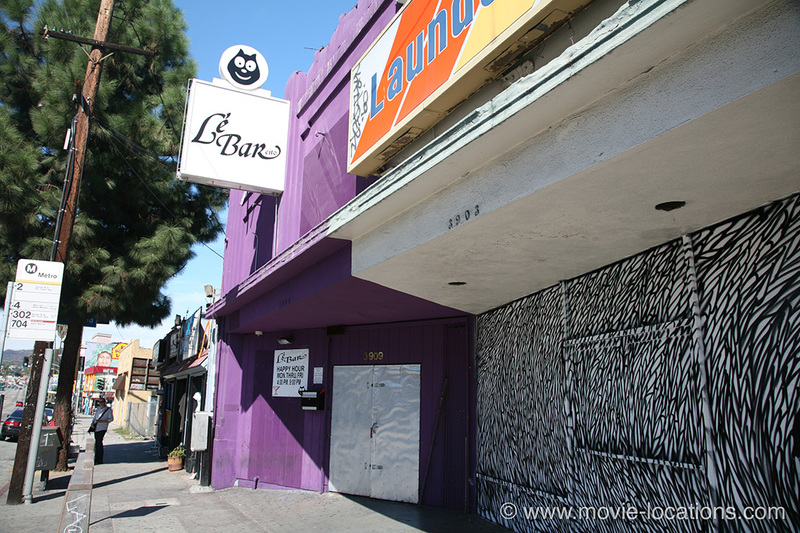 The bar went on to become Le Barcito and in, November 2008, was designated a City of Los Angeles Historic Cultural Monument. It was also seen as ‘Lazy Joe’s’, the ‘Hawaiian’bar in Forgetting Sarah Marshall. It closed down in 2011 but has since reopened as a restaurant under the original name of The Black Cat.